1673 – Iowa, first seen, Mississippi explored, taken by France. 1762 – Louisiana, including Iowa, ceded by France to Spain. 1788 – Julian Du Buque mined lead with Indians. 1799 – Jean Faribault traded with Indians near present state capital. 1800 – Louisiana ceded to France from Spain by secret treaty. 1803 – U. S. bought Louisiana from Napoleon, 15,000,000. 1804 – Indiana territory included what is now Iowa. 1805 – Pike explored the Mississippi; Lewis and Clark, the Missouri. 1805 – Louisiana territory organized, St. Louis, the capital. 1808 – Army post, Indian factory established at Fort Madison. 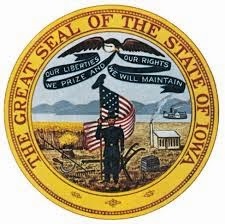 1812 – Iowa became part of Missouri territory, newly formed. 1816 – Fort Armstrong established on Rock Island. 1821 – Iowa left out when Missouri was admitted as state. 1830 – School opened in Lee County, the first Iowa settlement. 1834 – First Fort Des Moines established, Montrose, Lee county. 1834 – Iowa attached to Michigan territory; 2 counties formed. 1836 – Wisconsin territory formed; Burlington, the capital. 1836 – 1st newspaper, the Du Buque Visitor. 1838 – Iowa became a territory July 4; population 22,859. 1843 – Fort Des Moines II established at Raccoon forks. 1846 – Iowa the 49th state, Dec. 28; population 102,388. 1846 – Town of Fort Des Moines platted; 1856 became a city. 1854 – First locomotive into Iowa Davenport; railroad across Iowa, 1867. 1857 – Adopted new constitution – progress, freedom, home rule. 1866 – Railroad into Des Moines; stages, steamboats out. 1898 – Grand monument erected to Iowa’s soldiers, sailors. 1915 – Capitol grounds enlarged to 93 acres under Governor Clarke. 1950 – Iowa, population 2,621,073. 1960 – Iowa, population 2,757,537, a 5.2 percent increase; land area, 55,586 square miles; railroads, 8,697 miles; primary highways and primary highway extensions, 9,847 miles; interstate highways open to traffic, 247 miles; colleges, 51; schools, 4,059; daily and weekly newspapers, 450; radio stations, 74; television stations, 13; state parks and preserves, 91; natural lakes, 72; artificial lakes, 24; inland streams, 900 miles; boundary streams, 600 miles; industries in manufacturing plants, more than 3700.